St. John’s seniors were at home on Friday night to face Saval in Division two. St. John’s finished the first half leading the Saval men 2-4 to 1-6 but goals in the second half saw Saval leave Pairc Naomh Eoin as the victors. The Committee of St. John's would like to Thank Conor Flanagan from DC Plumbing and Heating for his generous sponsorship in sponsoring Friday’s Match and look forward to revealing the new away kit. Saturday was the start of the Season for many of the U10s. The first Blitz of the year was hosted by Liatroim. Although it was a fierce cold day, the young johnnies took to the pitch like young calves turned out on to fresh grass. The small but effective team met Darragh Cross, Liatroim 1 & 2 and finally Dundrum. Displaying outstanding team work and effort throughout resulted in a great show of skill. Well Done to all the young players. The Management would like to Thank the Parents and Supporters who came to help out and support. This level of commitment is greatly appreciated. 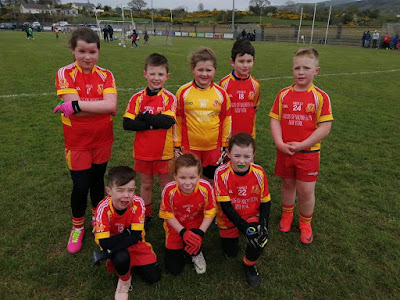 St Johns Under 12s played their second game of the season at home to Loughinisland on Sunday morning hoping to follow up on last weeks win over Aughlisnafin. The cold and windy conditions made it difficult for both sides throughout the game and St Johns faced a strong wind in the first half and the visitors opened the scoring with a point from play. To their credit the Johnnies responded immediately and scored points of their own through Rory McCreanor (0-2), John Joe McMullan (0-2) and Nathan Doran to leave the half time score St Johns 0-5 Loughinisland 0-1. Playing with the wind, St Johns dominated the opening stages of the second half and Nathan Doran opened the scoring with a point before Rory McCreanor scored the Johnnies only goal of the game. Calum Cluskey, Rory McCreanor and Conor McGrattan tagged on points to give the Johnnies an eleven point lead but the visitors then scored two goals and a point in quick succession to cut the gap to just four points. Only for a couple of saves from Shea Murphy in goals the scoreline would have been even closer and to the relief of the home side Conor McGrattan scored another point in the closing stages after good work by Joe Burns to leave the final score St Johns 1-10 Loughinisland 2-2. St Johns Squad: Shea Murphy, Eoin McCreanor, Mel Cahill, Conor McCann, Jay Flanagan, Peter Og Morgan, John Joe McMullan, Rory McCreanor, Shea O’Connor, Joe Burns, Calum Cluskey, Ryan McCourt, Jack McMullan, Nathan Doran, Conlan O’Boyle and Conor McGrattan. Thanks to Loughinisland for the sporting game and to all who came along to support the squad. The Under 12s have no game next Sunday and then travel to Bredagh on Sunday 28 April. Well Done to everyone who helped make the Ladies Team Coffee Morning a success by either baking, attending or donating. A fantastic amount was raised and will help the ladies with this Season’s campaign. Next Floral Arrangement Class is tonight, Wednesday 17th April at 7pm. Please Contact Mandy O Connor to book your place on 07950 999429 and for info on what you will need or see our Facebook page. The Baby & Toddler group at St. John’s will be off next week for Easter. Some of the club clothing order placed in March is now in so keep checking Facebook for updates on the opening of the club shop. St. John’s walking group had two outings last week. 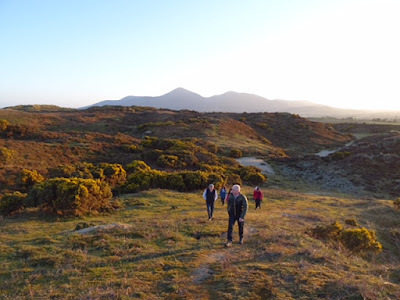 We enjoyed our first midweek walk at Murlough on Wednesday (10th April) and ventured up the Annalong Valley on Saturday. The next outing is on Wednesday 24th April when we go to Clough. 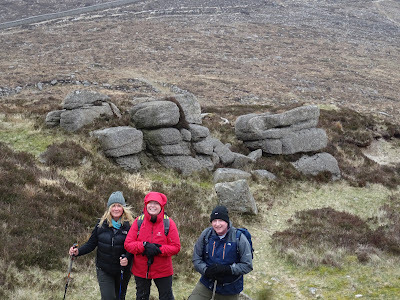 This is followed by our first bus trips of the year, to the North Down Coastal Path on Saturday 27th and to Slieve Gullion in south Armagh on Saturday 11th May. Booking is essential for the bus trips. No jackpot Winner. 1,7,8,12 £10 winners, Chris Clarke, Sarah McMullan and Karen McEvoy. This week’s jackpot is £5,700. Renew your ticket on Klubfunder.